Did you know that Larry Page, the CEO and co-founder of Google, is an University of Michigan Alum?! This could be why he chose Downtown Ann Arbor for one of Google’s 70 locations in 40 different countries around the globe! In each of their office buildings, Google tries to express the personality of the city it is located in through different murals and decorations, so no two offices are ever alike. 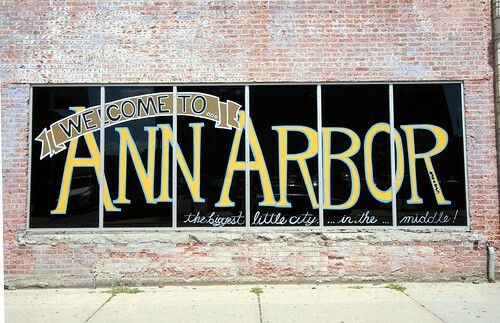 So stop by the Google Building, located at 201 S. Division Street, and see how Google expresses Ann Arbor! The River Gallery, located at 120 S. Main St. in downtown Chelsea, MI is an art gallery features mixed media such as prints, paintings, drawings, and sculptures. Head over to their website to join their mailing list or check out current and past exhibitions. The 52nd Annual Ann Arbor Art Fair 2011 was held on Main St this past week and weekend in downtown Ann Arbor, MI… from crafts, art, beaded jewelery, and beaded sweat on foreheads, all of Ann Arbor’s residents and surrounding families came out for the fair. Along with the booths were art acitivties for the kids and street performers, plus of course, lots of food! Zou Zou’s Cafe is located right in downtown Chelsea. Zou Zou is a French themed cafe thats not afraid to get artsy! Their prime Main St. location makes it the perfect spot for showcasing local music and proudly sells local artists pottery and art. It’s a cozy place to sit in and sip a hot beverage or sit outside overlooking and soak in the historical feeling of downtown Chelsea. Throughout Ann Arbor there are tons of places where you can find wonderful hidden spots of art. On Liberty and State is a great wall mural of poets and just down the street from that is an alley of hidden local art. On Miller Rd under the train tracks is a great mural as well. It all just adds a little spice to the Ann Arborites life. There are so many colors and wonderful things to look at while traveling through downtown Ann Arbor. Even while shopping the boutqiues and walking up and down the sidewalks theres always something interesting to take a glimpse at; from the people to the buildings to the art that surrounds them! The Ann Arbor Arts Center is located on W. Liberty in downtown Ann Arbor. The center is responsible for the Kerrytown mural, and decorating local businesses, it offers various art galleries and exhibits and is open for volunteering. Ann Arbor truly does equal ART! From the unique architecture of the buildings and homes, to murals, window art, and yes even the bike racks, to (especially) the people! It’s the perfect place for the downtown art fairs & festivals that happen annually. Theres always something interesting to look at in Ann Arbor! Ann Arbor Art is Everywhere! I was out the other day taking photos of Ann Arbor Condos, when I walked past a convenience store and saw this painted on the side of the building. Ann Arbor is such a great town filled with a wonderful combination of artists, professionals, techies, students, and eclectic folk. I love selling Real Estate in Ann Arbor!